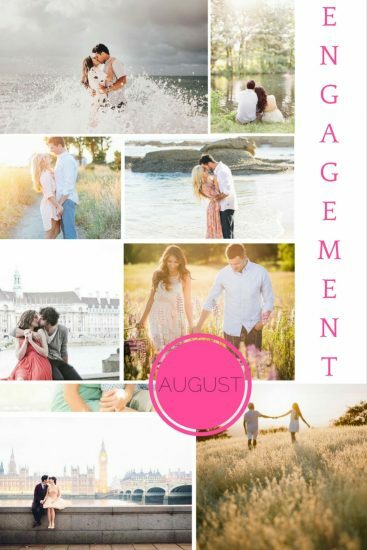 Stunning August engagements are always a favourite of ours. It’s the perfect time to capture city-dwelling lovebirds in the hustle and bustle of their hometown. All of the trees are in leaf, there are beautiful hanging baskets on every corner as well as street vendors and buskers galore. If your newlyweds prefer a quieter engagement shoot, then consider visiting a local lake with a picnic or just spending some quality time in the great outdoors. The dappled sunshine and infamous golden hour are guaranteed to make beautiful images. Or perhaps if you live near the coast, now is the time for some truly dramatic images. Is there anything more movie-like than sharing a kiss as the waves crash around you?